Last week the news broke that Conor McGregor is likely to face Nate Diaz at UFC 200, and apparently the bout is more than just a rumour. 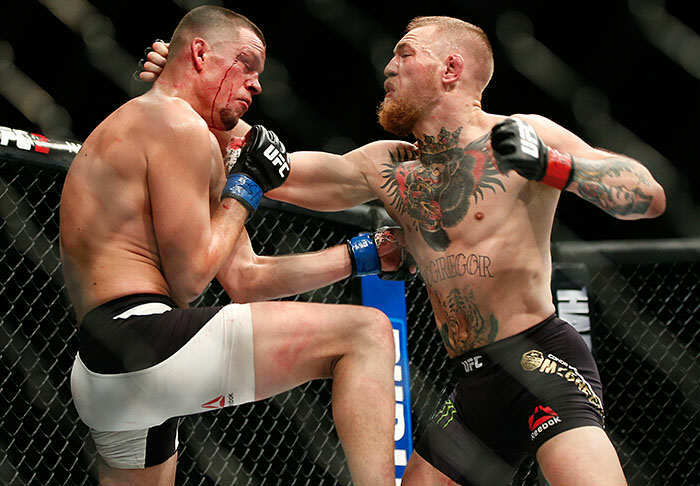 Speaking on The MMA Hour Ariel Helwani said that ‘The Notorious’ is obsessed with avenging his defeat to Diaz. Helwani also revealed that, contrary to some early reports, the UFC has already put contracts on the table as they seek to confirm the fight at 170lbs for July. By the time that news came out a lot of people said ‘Well, they’re working on it, but there are no contracts.’ I can assure you that the contracts had already been issued. Not signed, but anyone who told you that there were no contracts issued thus making it less of a real thing, that was inaccurate. Make no mistake about it, the reason this fight is happening at 170 lbs is because, to be frank, Conor McGregor is a bit of a wildman. He is obsessed with the idea that he lost to Nate Diaz at 170 lbs, he feels like he should have won, and he wants the same circumstances. He wants to do it again, and prove that he is the better man. Is it the right move? We’ll have to wait and see, but it certainly sounds like McGregor-Diaz 2 is happening.